Hours to carve. Minutes to erase. A couple of years ago I saved some iroko science lab workbench tops from the landfill. They were stripped out of our school’s biology labs. Apparently the sanding wasn’t keeping up with the carving! Weirdly they had been painted to cover generations of hand tool work by bored students. I started planing the paint off and quickly discovered the iroko would tear out in both directions. So I switched to the toothing iron in the block plane. Planing diagonally across the grain I quickly brought the surface down close to the bottom of the deepest carvings. I then put the toothing iron in the 62. It’s much narrower than the bed of the plane but the cap iron held it firmly and I set about flattening the rest of the board. I’ll smooth it with a card scraper. The work tops will go on the wood rack to make a dedicated sharpening bench so I’m not too worried about a bit of student history showing through or a mirror finish. Perhaps we should give the students who don’t enjoy science some decent carving gouges and a block of lime? The bruising on the rail matches the crochet. Any suggestions? A lot of my woodworking has been ad hoc. I had limited space and time, kept my tools in a portable box, had what our cousins across the pond call a “knock-down” workbench (and which I’ll be calling a “folding” bench, “collapsible” is so pejorative) and would set up whenever and wherever was convenient. The sitting room was a favourite. Understandably The Anarchist’s Toolchest by Chris Schwarz held a certain appeal. He advocates a limited set of tools and a self-sufficient attitude. Recently he’s been building a folding workbench which seems very much in the spirit of the book: low cost, flexible and sturdy and built by the user. And portable. But as instructed in the introduction to the ATC I’m going to take issue with Mr. Schwarz. He’s put a crochet on his bench. In the interest of keeping my own bench light I did the same. Now that I have more permanent digs if I could work out how to attach a meaty face vise without substantially rebuilding, I would. Crochets are great for planing the edges of long boards: put a holdfast into the apron, rest the board on it, slide it into the crochet, swivel the holdfast to grip the board and knock it in with a mallet. Very quick and rock solid. They are horrible for almost anything else. 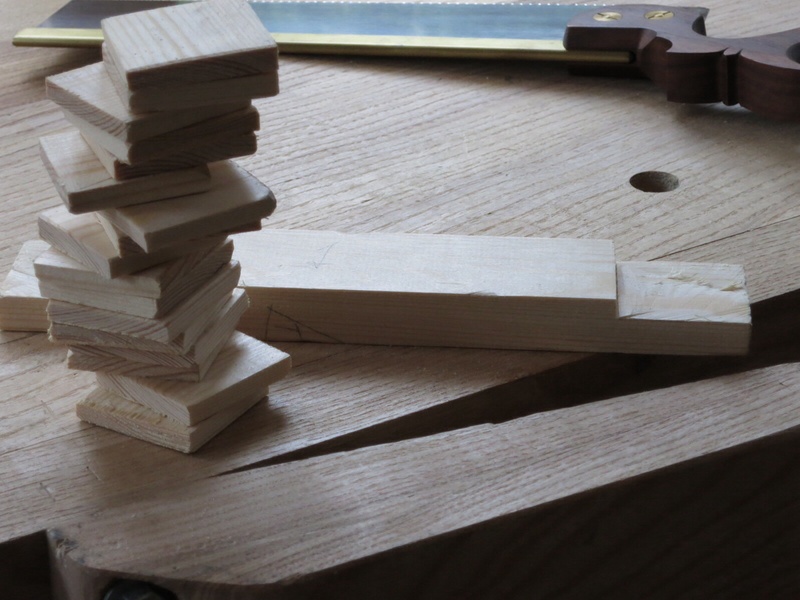 Try cutting tenons. 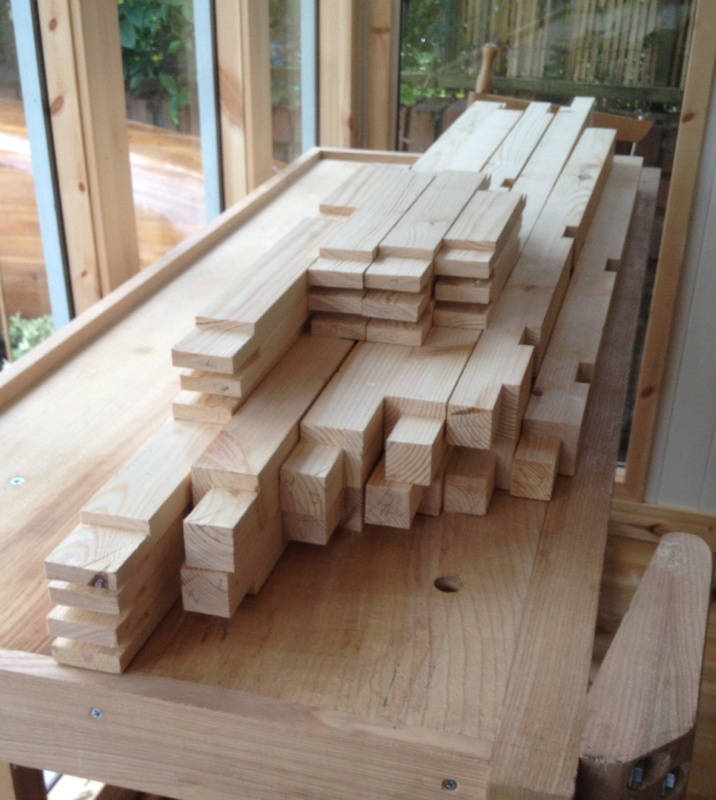 Yesterday afternoon I cut 30 bridle joints for a wood rack. I cut tenons by putting the works piece in the vice, tilting it away from me, cutting down one line, then across the top. Then I turn it around, repeat and cut to the shoulder line. In a crochet this means jamming it in the top corner and trying to get a holdfast on the lower section. Then when you cut the saw pushes the workpiece further into the corner, bruising the wood. Since I’m cutting a framework for shop furniture and it will be neither precious nor visible I don’t mind the bruising. But I will on the next project. So if you can think of a better way to cut tenons in a crochet, let me know. If you’re thinking of building Mr. Schwarz’s folding/take apart/collapsible/knock-down bench, go ahead, it looks terrific. But for your own sanity take the leg vice option. 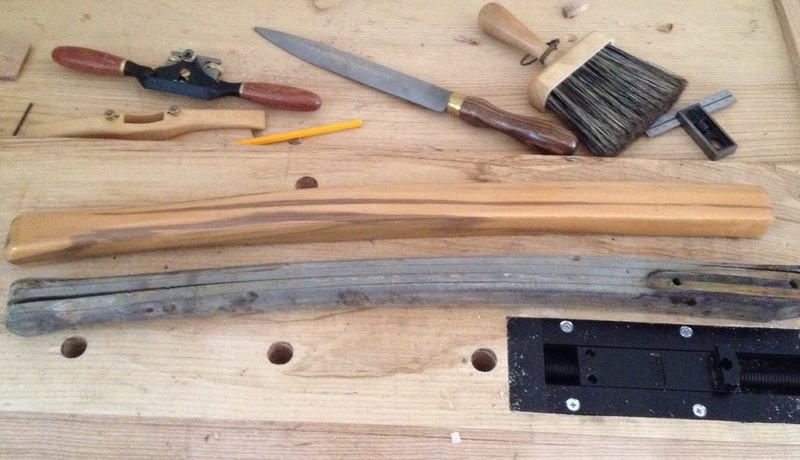 Spokeshaves and a rasp used to shape a solid ash tiller. So much more pleasant than a round over bit in a router. 1. making little or no noise: the car has a quiet, economical engine | I was as quiet as I could be, but he knew I was there. ■ (of a place, period of time, or situation) without much activity, disturbance, or excitement: the street below was quiet, little traffic braving the snow. ■ without being disturbed or interrupted: all he wanted was a quiet drink. 2. carried out discreetly, secretly, or with moderation: we wanted a quiet wedding | I’ll have a quiet word with him. ■ (of a person) tranquil and reserved by nature: his quiet, middle-aged parents. ■ expressed in a restrained or understated way: Molly spoke with quiet confidence. 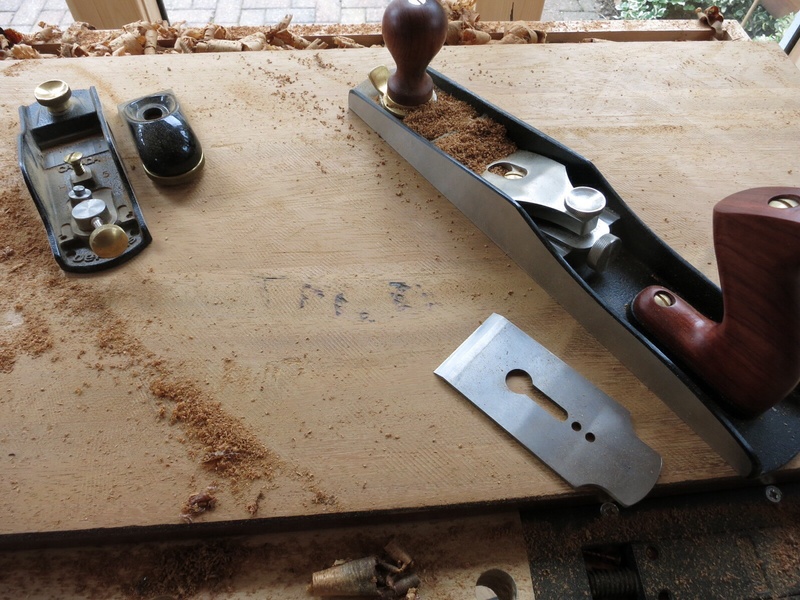 Given the choice of the screaming router or the gentle swish of a moulding plane I’d opt for the old piece of beech. That doesn’t mean that I’m committed to a style of woodworking that requires breeches and frilly sleeves; I just like peace and quiet. By the same token you’re unlikely to find me chopping out a housing with a 2″ firmer chisel (though I do have one if it’s the only alternative). The relative quiet of a large brace and bit is more conducive to inner (and outer) peace. This doesn’t preclude power tools. Though there’s nothing as disruptive to a gentle afternoon’s woodwork as the cries that accompany a table saw accident.